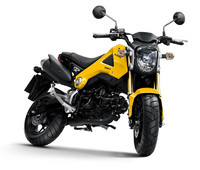 The MSX125 (“Mini Street X-treme 125”) carries on the tradition of the original, small-wheeled leisure motorcycle, defined by Honda in 1963 with the iconic Monkey, and continued with the Dax and Ape. Manufactured in Thailand, the MSX125 is small enough to be supremely manageable yet has a fully-fledged feel thanks to a selection of standard sized motorcycle parts. It is part mini-bike, part motorcycle, with engaging performance matched to confident handling and styling that combines a sense of fun with a tough, urban edge. The MSX125 is powered by a well-proven and efficient 125cc fuel-injected 4-stroke engine, which has been refined for even greater economy and smoother torque and power delivery, and also features a motorcycle-style four-speed gearbox and clutch. Complementing the power train is a compact chassis that features a sturdy steel frame, inverted front forks, monoshock rear suspension, hydraulic disc brakes (front and rear) and lightweight 12-inch wheels sporting wide, low profile tyres. The MSX125 is due on sale in the UK in late spring 2013.